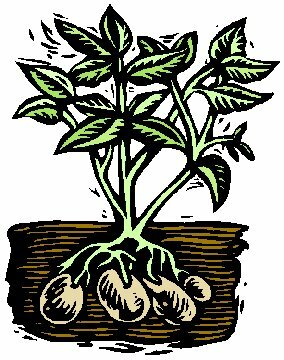 Have you ever tried growing potatoes in tough clay soil? The results are usually less than bad. However, here is the perfect solution for growing great potatoes. Grow them in a pot. Now, whether you have clay soil, live in an apartment, or don’t have a garden at all, you can grow potatoes the ole’ yard boy way. And that’s in a container. A Container: Bushel baskets work good. They breathe well, allow for good drainage, and they look great! However, any container, plastic, wood or clay will work as long as it has good drainage and is at least 14-18 inches wide and at least 10-12 inches deep. Soil: Soil-less potting mix works best. Use the good stuff for better results. If you have a compost pile, good compost will work too. Finely shredded is best. People have even used straw and ground leaves. Fertilizer: An all purpose garden food such as Osmocote is great. Seed Potatoes: These can be found at the garden center and are used specifically for growing potatoes. Do not use potatoes from the produce department at the grocery store; they have been treated with a growth inhibitor to keep them from sprouting. Getting Started: Fill the bottom of your pot with 2-3 inches of soil-less mix or compost. Take a large seed potato, or a couple medium sized, cut up into pieces that contain the eyes, and evenly distribute those on top of the soil-less mix. You can plant 6-8-10 pieces with eyes per basket. If you’re not sure about the ‘eyes’, you can plant whole potatoes, or cut them in half and plant the halves. Cover the seed potatoes with another 3-4 inches of soil-less mix, add the fertilizer and water in thoroughly, and place in the sun. Water as needed, thoroughly moistening the soil, then letting it dry before watering again. 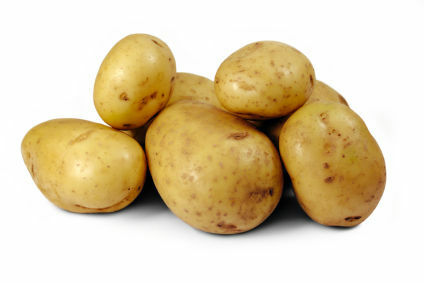 Once your potatoes start to grow, water regularly, being careful not to over water, which can cause the tubers to rot. 1. As the potatoes grow, keep adding soil-less mix or compost to the container, keeping about 4 inches of foliage showing. Continue this process until the container is filled to within 1 inch of the top of the basket. 2. Let the foliage grow until it’s approximately 3-4 inches above the basket, and then fill in around the foliage with your soil-less mix or compost unit the basket is full. Now you’re set for growing potatoes! Let your potatoes grow all summer. Don’t forget to keep them fertilized. Come late summer or fall when the foliage starts to yellow, cut the foliage off, dump out your soil, and you’ll have a basket full of taters! It is that easy. Good Luck! !